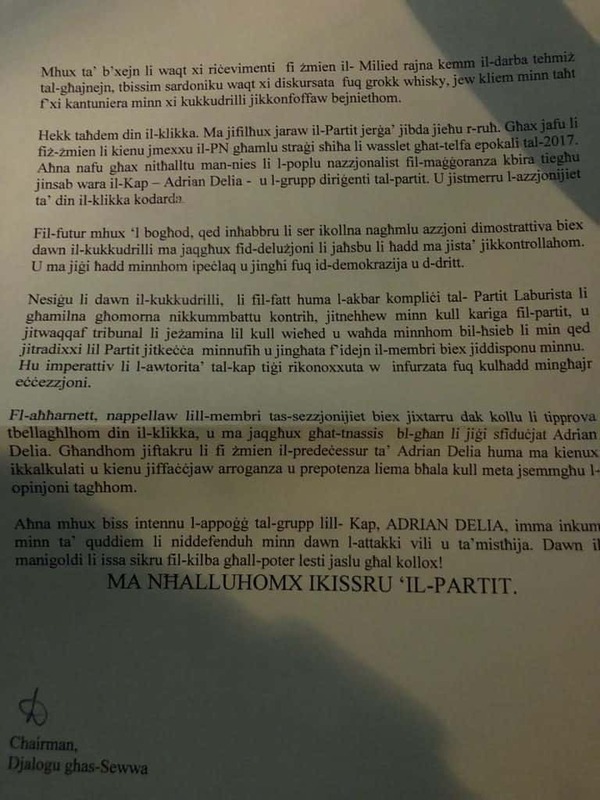 Several PN Councillors have received in their postal mailbox a letter signed cryptically by someone describing himself as “Chairman, Djalogu għas-Sewwa” calling for support to party leader Adrian Delia and the “disposal” of “insubordinate crocodiles”. The letter is the last in a series that have been dispatched by conventional mail to Party Councillors bearing the image of a displayed eagle with the fasces. The image is a classic Fascist symbol and this particular design was used as the arms of the Repubblica di Salo’, the puppet regime that governed the German occupied territories in the North of Italy during the last months of the Second World War. “This is why we, veterans of the Party that can read the signs of the times, and on a background of the underlying whispers that we perceive, had warned the Chief the minute he took over the leadership to keep under his watchful eye and under the absolute control of the new administration this bask of crocodiles starved of power”. In my defence the exclamation mark is in the original, one of several. The text goes on to accuse these “crocodiles” of destroying Adrian Delia’s family and using that to undermine him. It then reaches its climax: “In the near future, we are announcing we will have to launch a demonstrative action to disabuse these crocodiles of the delusion that lets them think no one can control them. Let not one of them then mumble or moan on democracy and law. “We require for these crocodiles — that are in fact accomplices of the Labour Party against which we have struggled all our lives — to be removed from any rank in the party, and for a court to be set up to examine each and every one of them with a view to dismiss immediately those that are betraying the Party and for them to be handed over to the members for disposal. “It is imperative for the Chief’s authority to be recognised and enforced by everyone without exception”. 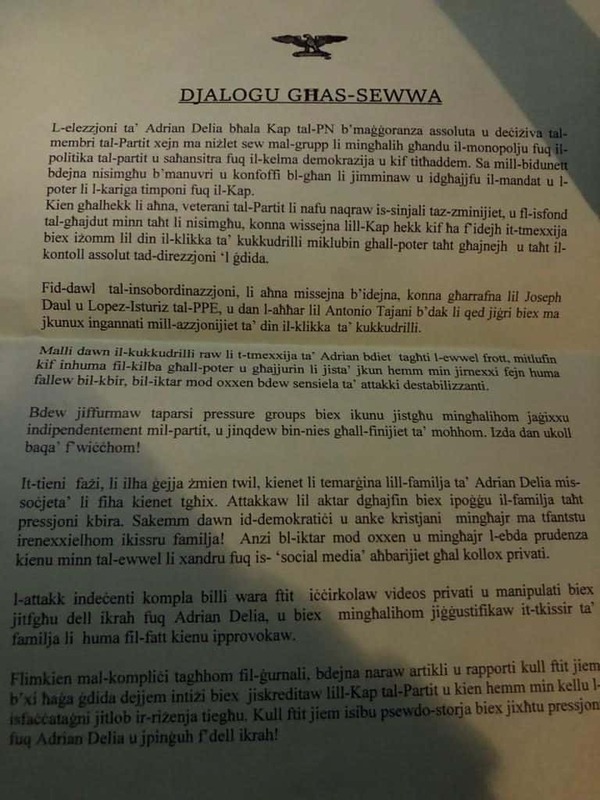 There is no reason to suspect this sort of letter is the initiative, or even enjoying the silent blessing, of the PN’s leadership. Delusional fascist nostalgists have been a permanent fringe feature within the PN that for generations have been frowned upon as an embarrassment like a smelly great-uncle who insists on keeping the children on his lap at family Christmas parties. But these black-shirt apologists are veterans of decades of complaint that successive PN governments have been centrist with a distinct shade of left-wing progressive politics. Many of these proto-fascists have indeed moved over time to the Labour Party like the notorious Jo Meli and Stefan Grech to name two. Significantly, however, this unidentified latter day fascist who claims to continue to be a veteran of the PN, pledges support for the current leadership of the PN and calls for the “disposal” of those that don’t.